After a tremendous response to the initial winter run, the tour has been extended with another 12 dates added in April and May with special guests Kane Brown, Morgan Evans and Dee Jay Silver. Tickets and VIP packages for the “Chris Young Losing Sleep 2018 World Tour,”go on sale beginning Friday, December 8 at 10am (local time). American Express® Card Members can purchase tickets before the general public beginning Wednesday, December 6 at 10am (local time) through Thursday, December 7 at 10pm (local time). A limited number of exclusive VIP Packages will also be available for sale starting December 5. These exclusive offers can include premium tickets, access to a pre-show VIP Hang (includes an exclusive performance and special Q&A session), limited-edition lithographs, autographed memorabilia and much more. Ticket buyers will have the opportunity to redeem a CD or digital copy of Chris’s new album, Losing Sleep, with every order. Tickets and VIP packages can be purchased at ChrisYoungCountry.com. 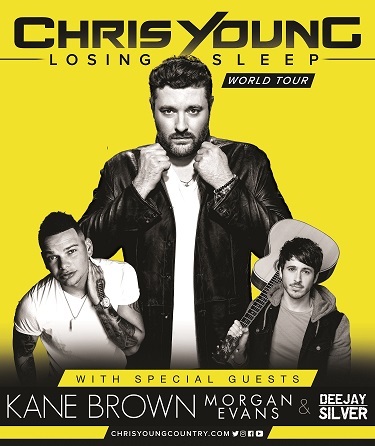 Preview the “Chris Young Losing Sleep 2018 World Tour” here: https://youtu.be/-4lCfuoJjAs.